A colleague alerted me to the Hays Global Skills Index. It is a complex, statistically-based report designed to assess the dynamics of skilled labour markets across 33 countries. Education flexibility – this indicator relates to how flexible the education system is to meet the changing demands of the labour market. Low score = more likely. Overall wage pressure – skills shortages are an issue if wages are growing faster than the cost of living. Low score = wages are not rising quickly. Wage pressure in high-skill industries – Some industries require higher‑skilled staff and makes them more vulnerable to skills shortages. Low score = wages in high-skill industries are growing slower than wages in low-skill industries. Wage pressure in high-skill occupations – a rise is wages of high-skilled occupations means that there is a shortage. Low score = wages for high-skilled occupations are rising more slowly than those in low-skill occupations. In looking at the figure below seven indicators above are given equal weight when calculating the overall Index score for each country. Each indicator measures how much pressure different factors are exerting on the local labour market. Higher scores mean that a country is experiencing more pressure than has historically been the case. Lower scores mean that a country is experiencing less pressure than has historically been the case. This entry was posted in Labour Market, Unemployment and tagged Structural Unemployment, Wages on November 3, 2016 by Mark. Currently covering Labour Markets with my A2 level classes and put together an exercise which tests them on calculating MCL, MRPL etc and also showing why MCL = MRPL is the number of workers a firm should employ. There is an exercise for both Perfect and Imperfect Labour markets – see ‘Word’ document. The excel document is a model answer showing the data in a table and a graphical format. Hope it is of use. This entry was posted in Labour Market, Teaching visuals and tagged Wages on August 24, 2016 by Mark. It is nothing new to consider how machines can perform the tasks done by the layout force. Experts believe that it is not blue collar or white collar jobs that are at risk but those jobs that are routine or non routine. Manual labour tasks have been constantly under pressure from technology but now more jobs that have cognitive tasks are now feeling the pinch. It is estimated that the development of machine learning will impact 35% of the workforce in Britain and 49% for Japan. See chart from The Economist – Computerisation of different occupations. Economists are already worrying about “job polarisation”, where middle-skill jobs (such as those in manufacturing) are declining but both low-skill and high-skill jobs are expanding. In effect, the workforce bifurcates into two groups doing non-routine work: highly paid, skilled workers (such as architects and senior managers) on the one hand and low-paid, unskilled workers (such as cleaners and burger-flippers) on the other. 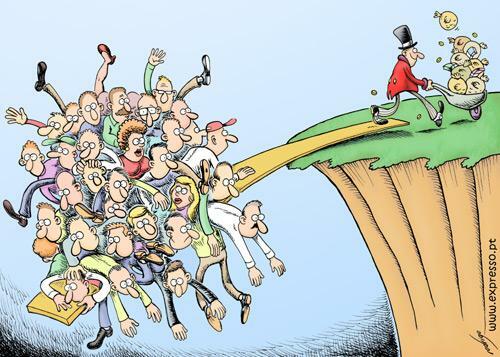 After two centuries in which capitalism has dominated the western world, this economic system has become desperately dysfunctional: inequality is growing, climate change is accelerating and nations are beset with bad demographics, debt burdens and angry voters. “goods, services and organisations are appearing that no longer respond to the dictates of the market and the managerial hierarchy”. More specifically, people are collaborating in a manner that does not always make sense to traditional economists, who are used to assuming that humans act in self-interest and price things according to supply and demand. People who are not working, or are working part-time, are not penalised if they decide to work more, because their welfare payments do not decline as their incomes rise. It gives people more freedom to decide how many hours they wish to work, and might also encourage them to retrain by providing them with a small guaranteed income while they do so. Those who predict significant job destruction see it as a way to keep the consumer economy going and support the non-working population. If most jobs are automated away, an alternative mechanism for redistributing wealth will be needed. It is regressive as spending on existing welfare schemes would reduce income for the poorest, while giving the high incomes money they do not need. Furthermore funding such a venture would require a much higher tax rate that at present. The basic income would discourage some people from retraining, or indeed working at all—why not play video games all day?—though studies of previous experiments with a basic income suggest that it encourages people to reduce their working hours slightly, rather than giving up work altogether. Whether technology will take over jobs and ultimately humanity is dependent on the rate of change and how we live through the long transition from capitalism (the state and the market) – to post capitalism (the state, the market and the shared collaborative economy). This entry was posted in Labour Market, Unemployment and tagged Technology, Wages on July 14, 2016 by Mark. With Leicester City being crowned as EPL champions it was only time before someone in the media produced data showing the correlation between a club’s wage bill and their final position in the EPL. What is so extraordinary about Leicester’s feat what that it wasn’t a one off victory in the FA Cup or something similar but a competition that involved 38 games in the season. With Leicester just surviving relegation last year the odds on them winning the EPL were 5,000 to 1. What is so unique about their feat is that since the 1995-96 season the champion side has spent 225% more on player salaries as the median team. Arsenal, Chelsea, Manchester Utd and Liverpool have paid the highest wages to its squad of players and finished in the top four positions in the EPL 80% of the time. The total cost of Leicester’s regular team (£25m, or $36m) this season was less than a quarter of what Manchester United spent on new players last summer. Furthermore, if you look at Leicester City’s wage bill this year it is 75% of the league median which makes them, after Newcastle Utd in 2001-02, to break into the top four with a below-median wage bill. However, Leicester’s success means that affluent clubs will spend even more money on sports science, video analysis and get the best people to work in these departments. No doubt that this will move the transfer market towards ‘perfect competition’ as information will flow more easily and clubs will not be able to benefit like Leicester in picking up players whose value has been underpriced. Therefore an advantage by one club will lead to only a temporary advantage until other clubs catch up. Consequently things will return to normal as talent will be distributed to those who can pay the most. Click here to go to The Economist website to access their interactive image. This entry was posted in Sport and tagged Football Player Salaries, Wages on May 7, 2016 by Mark. Union membership and minimum wages are usually thought to reduce inequality by helping the distribution of wages. However although stronger unions and an increase in the minimum wage has the potential to reduce inequality, the fact that wages go above the market-clearing level could mean unemployment increases leading to higher inequality. Strong unions can persuade political parties to engage in more redistributive policies. By getting workers to vote for parties that promise these policies there is a greater chance of them being implemented. This entry was posted in Inequality and tagged Wages on May 1, 2015 by Mark. Big Firms = Greater Inequality? The Economist in their Free Exchange column had an interesting piece on the size of firms and the growing disparity in wages. In America the best-paid 1% of workers earned 191% more in real (ie, inflation-adjusted) terms in 2011 than they did in 1980, whereas the wages of the middle fifth fell by 5%. Economists have long recognised that economies of scale allow workers at bigger firms to be more productive than those at smaller ones. That, in turn, allows the bigger firms to pay higher wages. This should not, in theory, cause a rise in inequality. If the chief executive and cleaner at a larger firm are both paid 10% more than their counterparts at a small firm, the ratio between their wages—and thus the overall level of inequality—should remain the same. 1. Larger firms find it easier to to automate tasks than smaller ones and if there is resistance from unskilled workers over the wage rate then mechanisation is always another option. 2. Because of the potential promotional prospects in a big firm workers are more willing to accept lower wages. But if governments wish to reverse the inequality big firms foment, reforms to the labour market are unlikely to do the trick. Instead, they will have to spur competition by reducing barriers to entry for smaller firms, most notably by improving their access to credit. That should reduce income inequality and boost economic growth at the same time. This entry was posted in Inequality and tagged Wages on April 21, 2015 by Mark. Why does rising employment not lead to higher wages? Unemployment figures in the US, Japan and the UK have reached levels that are below pre-crisis lows. In the US economy recent figures show that since 2010 10 million American workers have found employment – unemployment has fallen by 40%. Similarly in Japan the number of unemployed has fallen from 3.6 million to 2.3 million and in the UK the unemployed figures have been cut by 50% with 800,000 unemployed. The question that needs to be answered here is why has wage growth been stagnant when the demand for labour has increased? See graph below for USA. * In Japan Shinzo Abe (PM) recently announced that temporary workers should expect the same deals as their full-time permanent colleagues. As these steps lift pay and firms’ costs, inflation should follow. This entry was posted in Labour Market, Unemployment and tagged Wages on March 9, 2015 by Mark. 1. The unemployment rate is giving us a false signal, and there are millions more workers waiting to return to the labour market than suggested by the official statistics. That is, the jobless will return when the jobs return. 2. The natural rate is really much lower than most economists estimate. After all, at the end of the Clinton administration, unemployment was below 4 percent, while inflation remained low and stable. Business will only feel it necessary to increase prices if wage growth is greater than inflation and the rate of productivity growth. With the Fed Reserve targeting inflation of 2% and productivity growth at approximately 1-2% the economy is out of spare capacity when wage growth is between 3-4%. This suggest that there is currently spare capacity. This entry was posted in Labour Market, Unemployment and tagged Wages on October 7, 2014 by Mark.